Scottish roads were classified into the A and B system, with the A82 being routed across the ferry at Ballachulish as the road via Kinlochleven wasn’t finished. The High Road is numbered the A829, and when the Low Road along the north shore is finally completed in 1927 this too becomes the A829. It is not until the general renumbering of roads in 1935/6 that the A82 is re-routed via Kinlochleven, and the ferry road in North Ballachulish becomes a spur of the A828 Carnoch – Connel road. Following the 1921 Railways Act, and partially as a result of some of the problems associated with the railways during World War One, the Railways of Britain (with a few exceptions) were forcibly amalgamated into 4 big companies. The Callander and Oban along with the Ballachulish Branch line became, and the parent Caledonian Railway became part of the new London, Midland, Scottish (LMS) Railway. Their big rival, the North British, who ran the line into Fort William and Mallaig became part of what would become an even bigger rival, the London North Eastern Railway (LNER). 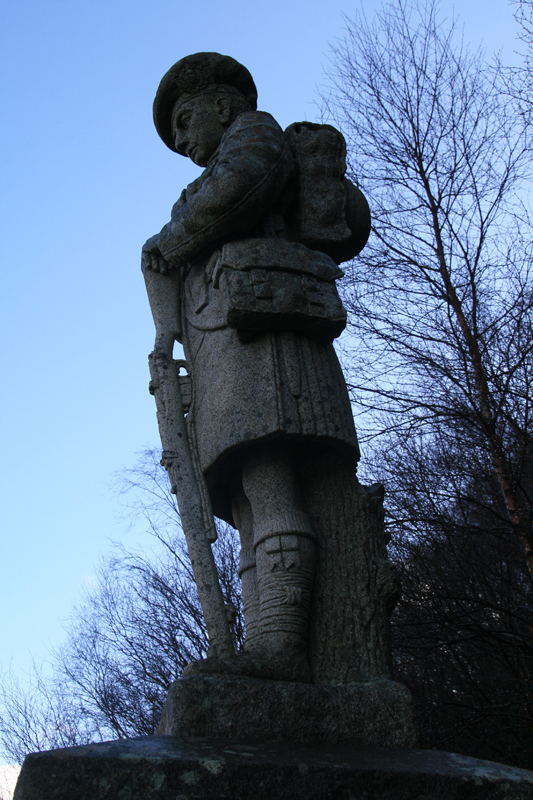 The Ballachulish and Glencoe War Memorial was unveiled nearly 5 years after the end of the Great War, and at the time stood well back from the road on the hillside near St Johns Church. Subsequent road improvements have brought the two closer together. It was unveiled by Lt Colonel Ian Campbell of Airds who was the commanding officer of the 8th Batt., the Argyll & Sutherland Highlanders. The memorial was designed by JM Love of Oban, and includes local Lettermore Granite in the plinth. Within a debate it was stated that the Ministry of Transport intended to improve sections of the road from Tyndrum through Glencoe, across the ferry and so ultimately as far as Inverness. With the successful introduction of the Turntable ferries just before World War 1, traffic across the ferry had increased and despite the imminent completion of road improvements via Kinlochleven, a two car turntable ferry, also named Glencoe, was introduced at Ballachulish in 1926. For the next decade, the two ran side by side, and so were named Glencoe I and Glencoe II by the locals and crew to avoid confusion. There is no suggestion of what happened to the other early ferry, if it ever existed. The Minister of Transport was asked about the road from Inverness to Glasgow. He replied that work was proceeding on the Kinlochleven to Ballachulish and Fort Augustus sections, which combined were costing around £130k. Surveys of the route from Tyndrum to Ballachulish were ongoing and tendering was to begin shortly. He could not say how much of the route would ultimately be improved, not when it might be completed. Another member then asked ”Is it conceivable that anybody will desire to go from Inverness to Glasgow?” The answer is not recorded! Bull 5s including the farmer. The Secretary of State for Scotland was asked about alledged proposals by the LMS Railway to close the Connel to Ballachulish line, and whether he would speak to the company about the inconvenience this would bring to local people. He replied that he was aware that the LMS wished to reduce the operating costs of the line, but that no definite decision had been made. The Minister of Transport was asked if he could say when the new road would begin construction, and whether unemployed Scottish men would get first chance at the jobs, rather than being left to gangers with foreign labour as normal. He replied that he hoped the first contracts would be put out to tender by Argyll County Council soon, and that he would pass on the suggestion with regards to the labour. However, it could not be made a condition as past experience in Dundee showed that men recruited from Labour Exchanges didn’t last very long on the job. The Minister of Transport was again asked about the road, and largely reiterated his hope that tenders would be invited soon. The costs so far amounted to around £15,000, and he reassured the house that despite recent announcements the funding for the road was secure. Further debate on Highland Roads reveals that the road from Blair Atholl to Inverness (A9) should be complete by September, and that the Glencoe section of the Tyndrum – Ballachulish road had been put out to tender, with a view to starting work as soon as possible. The Minsiter of Transport was asked, amongst other things, about money allocated form the road fund towards road improvements in Inverness-shire. He replied that £254,526 had been allocated in special grants towards the reconstruction of the A9 (Perth to Inverness) and Kinlochleven to (North) Ballachulish roads. The Minister of Transport was asked whether the £500,000 planned to be spent on the road was the best way of spending the money, or whether some of it could be better used in relieving rates on agriculture and industry, spending just a little to widen and surface the existing road. The answer was rather abrupt, stating that the dangerous condition of the road could not be improved with a small amount of money, and that the new road would be no less than 18 feet wide and would improve communications for the whole Western Highlands, and that it was considered good value for money. The Minister of Transport was asked about the delay to starting work on the new Tyndrum to Ballachulish Road. He replied that the delay was regarding contracts and the exact line to be taken, but that he hoped to settle these issues soon. Twenty Five years after Kentallen Pier opened, and started to draw traffic from Ballachulish Pier, the last regular steamer service called at the older pier at (South) Ballachulish. Whilst ships did continue to call at Ballachulish, there were no more scheduled services. This transfer coincided with the takeover of MacBraynes Steamers by a consortium including the London Midland & Scottish (LMS) Railway, which operated the Ballachulish Branch Line. Curiously, though, in 1934 tours describe onward travel by Motor Bus, and not by train! 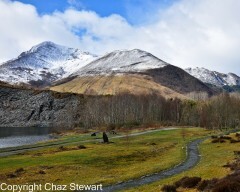 The Secretary of State for Scotland was asked about the repairs and reconstruction of a number of piers around Scotland, including Ballachulish Quarries Pier. It was also noted that a number of the piers were privately owned, but that the owners were willing to hand them over to the local authorities. The reply was that the matter was still under consideration. The A82 Trunk Route from Glasgow to Inverness saw substantial improvements in the early 1930s, with work starting in Glencoe in 1929 and then moving across Rannoch Moor in 1930-2. The Ballachulish to Fort William section was improved in 1932/3, with Kiacknish Bridge at Three Mile Water dating from 1933 and marking the end of the local works. At some point in this period there was apparently a proposal to construct a transporter bridge across the narrows of Ballachulish, similar to that across the Tees in Middlesbrough and immortalised by Auf Wiedersehen Pet! Obviously, nothing ever came of this adventurous plan, but it was perhaps the first proposal for a road bridge across Loch Leven. The Minister of Transport was asked the total estimated cost of the Tyndrum to Ballachulish road, and why so much was spent on this one project instead of using some of the money on roads which would prove to be of more economic value elsewhere in Scotland. The reply was that the 30 miles would cost £512k, and that it was first included as part of the unemployment programme back in 1924/5. The minister then stressed that the road would benefit large parts of the Highlands where communications were deficient, and that it was balanced against other routes such as the Glasgow – Edinburgh road. A further question about unnecessary expense on reducing gradients was dismissed. The President of the board of Trade was asked what the output of the Argyll Slate Quarries at Ballachulish, Cullipool (Luing) and Easdale was. He replied that in 1925 it was 8,186 Tonnes, but he had no more recent figures and did not know what the current stock holding was. In 1934 Argyll County Council started a program of works to improve the A828 Carnoch – Connel road. Work was slow to get going, but by 1939 most of the road had been improved, with just a few short sections to be finished in the 1950s after the end of the Second World War. Contrary to the Hansard extract below (1957) work was resumed in 1950/1, with two bridges bearing the date 1951. The construction of this new road led to an improvement in the bus service from Oban to the Ballachulish area, which presumably did not help the ongoing fight for survival which the railway line was facing. The operation of the Ballachulish Ferry was transferred from the Ballachulish Hotel to a new Ballachulish Ferry Company Ltd in 1935. The company was owned jointly and equally by the estates on either side of the narrows – to the north the Lochiel Estate of the Camerons and to the South the Ballachulish estate of the Stewarts. An unusual perk for the company’s manager was that the job came with a house – no lesser house indeed than Ballachulish House in Glenachulish! Shortly after the transfer of the ferry to the new company, a new ferry arrived. This was the two car Maid of Glencoe, which took over from the older of the two Glencoes. The following year the Glencoe II was also retired from the route, to be replaced by a sister vessel to the Maid of Glencoe, the Queen of Glen Albyn. The old Glencoe was not sent to the scrapyard, however, and instead became the first boat to operate a regular car ferry service across the Corran Narrows. She had previously been used to convey vehicles across to Ardgour on the odd occasion, undoubtedly at a price! Both of the new ferries were Clyde Built, coming from the yard of Hugh MacLean & Sons at Renfrew. In its first year of service, the Queen of Glen Albyn had quite an adventurous time, with the engine breaking down just as the boat was heading in to be secured for the night. The Maid of Glencoe was sent out at first light the next morning to find her, and eventually located the stray ferry off the coast of Kilmalieu some 9 miles away on the Kingairloch coast. Despite being July and the height of the summer, no ferries ran that day. At some point around 1937, work started on the construction of Albert Road as the new line of the A828 Trunk Road. This is described as a Ballachulish Bypass Road! This preceded the construction of the new housing scheme, although that was in mind. The line of the road cut off a small portion of the Jubilee Park, which included the Girl Guides Hut, which was also used as a pavilion for the Shinty field. Unfortunately, it appears that the workmen were rather unscrupulous in their job and simply smashed away the part of the building that was in their way, leaving the rest standing. The work of building the road also seems to have caused problems in the Jubilee, both to drainage and the level of the field which was left lumpy, although what caused this is unclear. The road was, unfortunately, left unfinished by the outbreak of war and it was 1951 before the bridge was constructed to complete the route. The 1937 edition of Johnston’s ‘Gazetteer of Scotland’ lists the population of Ballachulish at 727 but no figure is given for North Ballachulish. The cost of taking a car across the ferry in 1937 was between 2/6 (12½p) and 5s (25p). Drivers were charged separately at 4d (~2p) each, with additional passengers at 2d each. Pedestrian charges are not listed, but presumably were 4d each, with an additional 6d for bikes. It appears that a lower number of men lost their lives in the Second World War, with only 6 names listed on the Ballachulish & Glencoe War Memorial. A further 4 names are listed on the Nether Lochaber memorial.